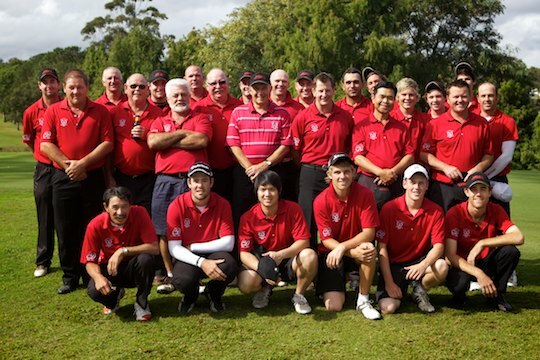 It was a first of many for Oxley Golf Club when they won the 2011 Division 1 Brisbane District Golf Association Pennant flag. Over 100 years had passed since the Club had won the Division 1 title. It was the first time in a number of years where a Club had won back to back wins with success in 2009 in third division, 2010 in second division, to then finish off a treble by winning Div 1 in 2011. Oxley finished the six round Division 1 series, nine and a half matches ahead of Indooroopilly, with Pacific finishing in third position. “We could not be happier with this result, which has been a long time coming,” said Oxley Captain, Jim Cox. In an event which comprises of eleven open, five seniors and five juniors team members, the Brisbane District Golf Association Pennant Series takes on a different format to that of New South Wales and Victoria. To win the Division 1 Flag in Brisbane, a club needs a strong cross section of players all the way through the three sections to seriously challenge the title. “We have a strong base at our club to pick from and that was shown with how well we played this season and with our recent efforts in the lower divisions,” says Cox. As one of the more working class clubs in the Brisbane Pennants, Oxley play with their heart on their sleeve and are proud of the club’s long tradition. “We have a strong bond at the club,” says Cox. The taste of victory was certainly flowing as supporters and players toasted their win back at the clubhouse on Boundary Road, on the south west outskirts of Brisbane. The win was also a sentimental victory for the club. One of the club’s most loyal pennant supporters, Calvin Daunt, had passed away recently from cancer and the win has been dedicated to him. “We knew Calvin was up there looking down on us and saying ‘go do it’,” said Cox. The level of emotion within the Oxley camp was certainly on a high. The club’s recent resurgence as a dominant force in Brisbane club pennants is testament to the commitment and trust the club has in its player system and the belief that it can take on any club and win. “We had so many great performances this season by the team,” says Cox. With three wins in as many years, the flags that hang on Oxley’s clubhouse wall will send a reminder to visitors that this working class club is passionate about its history and most importantly is proud of being who they are.